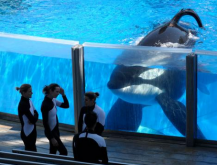 As SeaWorld finally phases out Orcas whales as an attraction, animal advocacy groups and animal lovers at large are pleased to finally witness the impending end of whales bred in captivity. This means that the captive killer whales currently held at SeaWorld parks around the world will be the last of their kind. The news comes after decades of bad publicity and a decline in visitor numbers, which came to a head after two trainers were killed by SeaWorld Orcas. These tragic incidents were well covered in the award-winning CNN documentary Blackfish and highlighted in my blog post titled: SeaWorld Is The 'Fail Whale' Of The Real World. Whales Live Longer Lives in the Deep Sea . 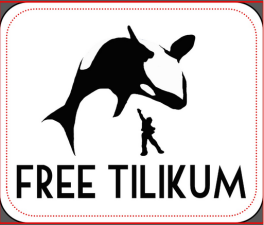 . .
Tilikum being observed by trainersFor over 30 years, Tilikum — Sea World’s largest and most dominant alpha Orca has lived a life of deprivation in an asylum that was certainly responsible for shortening his life. At 35 years old, had he not been taken captive, he would have been in the prime of his life. Orca male whales on average live to 70 and females can surpass a full century. According to a OneGreenPlanet report, Tilikum’s life has been one tragic abusive act after another, ever since he was separated from his family pod in 1981 at the age of two. As the story goes, he was then transferred from the sea on-board a ship, where witnesses noticed his pod was very disturbed and agitated. In fact, his mother followed in the wake of the fleeing boat for miles, as she heard her baby cry out for help. Dawn Brancheau with Tilikum before her tragic deathSince that heart-rendering beginning,Tilikum has lived most of his life in constraining 100-by-50-foot captivity pools, which were only 35-feet deep. There he was trained with food deprivation techniques and bullied by older whales during his childhood years. Part of the bullying was the result of his culture and language differences. SeaWorld never took into account, that as an Icelandic whale, Tilikum was unable to communicate with the Pacific Northwest Orcas he was forced to habitat with. Much has been written about how Tilikum grew up angry, hostile and acted out with tragic consequences that led to the death of two of his trainers. Some described his behavior as a mental psychological breakdown. 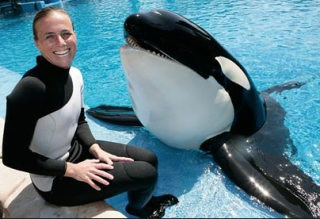 With the killing of trainer Dawn Brancheau, many animal behaviorists deemed the carnage, as a deliberate act of murder consistent emanating from a psychotic behavioral disorder. Recent reports by National Geographic in March indicate Tilikum’s health is rapidly deteriorating due to a drug-resistant bacterial lung infection. “He has a disease which is chronic and progressive,” an emotional SeaWorld veteran explained. “We have not found a cure.” The statement appeared to be an effort to prepare the public for Tilikum’s death. “Historically, we never put out that kind of stuff unless we were pretty sure they are going to die,” says John Hargrove, who trained killer whales for 12 years at SeaWorld before leaving in 2012. 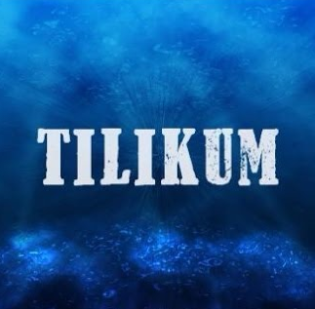 Hard to fathom, but like the ill-treatment of 19th century asylums for insane humans, the aquatic asylums Tilikum was sentenced to almost his entire life need to be closed down post-haste. His shortened life on this planet was due to callous mistreatment, motivated out of commercial greed.